falling victim to a cunning killer? In this first installment of the Thorny Rose Mysteries, the Lovers in Crime join newlyweds Lieutenant Murphy Thornton and Jessica Faraday to shift through a web of lies and cover-ups. Together, can the detectives of the Thorny Rose uncover the truth without falling victim to a cunning killer? 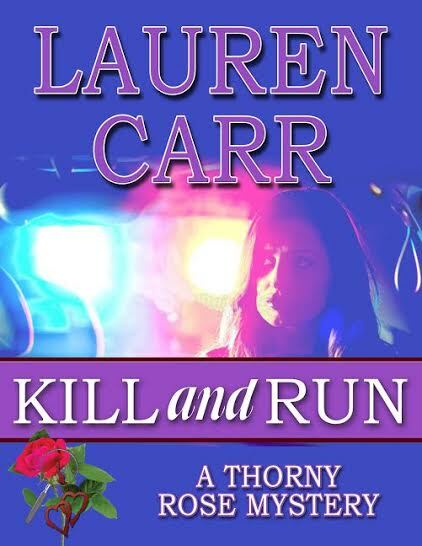 Author Lauren Carr is an established writer with many books under her belt including The Mac Faraday series and the Lovers in Crime Mysteries series. Now she is launching a third - The Thorny Rose Mysteries. Kill and Run is the first installment. In Kill and Run, the main characters are a husband and wife team of Murphy Thorton and Jessica Faraday who we met earlier in Three Days to Forever (review here). He is a specially trained, high level government agent, she the (now) wealthy granddaughter of a famous mystery novel writer. Married within days of meeting in the last book - they now take center stage in a new story of intrigue. The plot takes many twists and turns - a back story that becomes relevant, professional mob hits, military involvement, mistreatment of women, cover-ups and more. Romance is still there, but it takes a back seat in this story of intrigue with readers left quickly turning the pages to figure out where it will all end up. It great escapism - a chance to walk away from all the things on your plate - and for me, that takes top billing. I'm pretty sure I'll be reading more from this author soon.